Tom Lyon, professor of business economics and public policy and of environment and sustainability, spoke before the U.S. House Committee on Transportation and Infrastructure this week about ways he believes infrastructure improvement, as well as the free market, can help lessen the impacts of climate change. 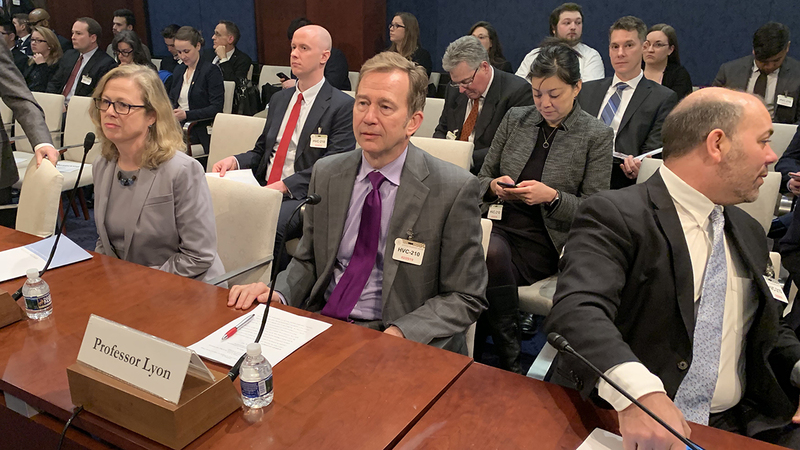 Lyon told the House panel Feb. 26 that “there is no question that U.S. infrastructure is in bad shape” and advised the members of Congress to consider how infrastructure funding might affect greenhouse gas emissions. Lyon discussed how market-oriented solutions offer incentives for innovation and cost reduction that can help mitigate the social costs of addressing climate change, and how the history of U.S. government policy for alternative fuels has been inconsistent, which warrants caution about picking specific technology solutions. Rather than building more highways, Lyon argued that using market mechanisms — such as taxes on driving, based on congestion levels — could help reduce congestion at a lower cost while also reducing greenhouse gas emissions. He also said a market-based approach, as opposed to government subsidies for different alternative fuels, would support how many new technologies are being developed by various automotive companies, including battery electric, hydrogen fuel cell, and hybrid electric. You can watch Lyon’s testimony to Congress here. Conversations With Consequence: How Can Business Better Innovate for Sustainability?